Yep. I’m nuts. A few days ago I decided that I simply had too few towels & I just had to weave a few more before this weekend’s RALA show. 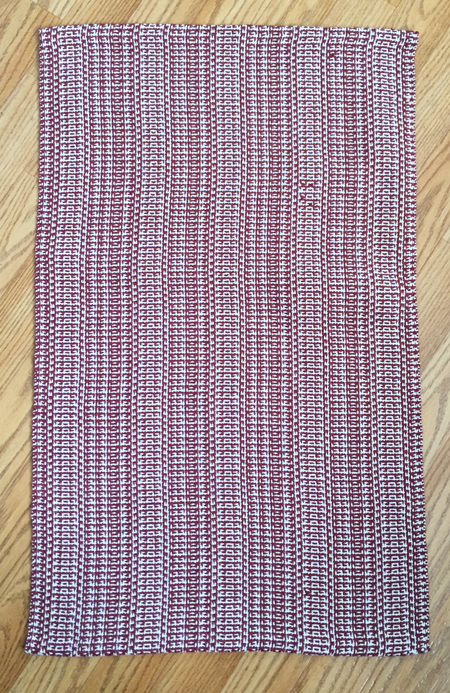 I set the loom up for some color-and-weave towels with a natural and a cranberry cotton, hoping that the cranberry was bright enough for the holidays without shouting RED at you. 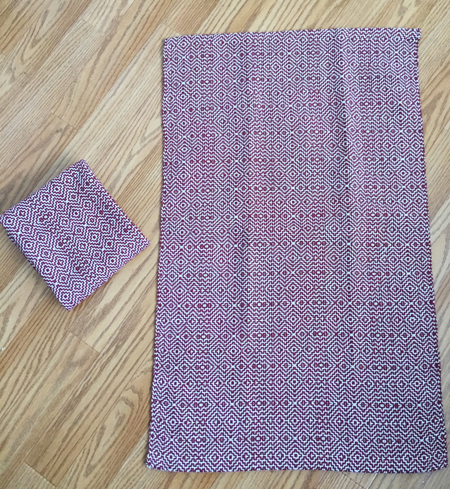 I had (and still have) lots of 10/2 cotton, which makes a thinner towel than I like, so I used it doubled in both warp and weft. 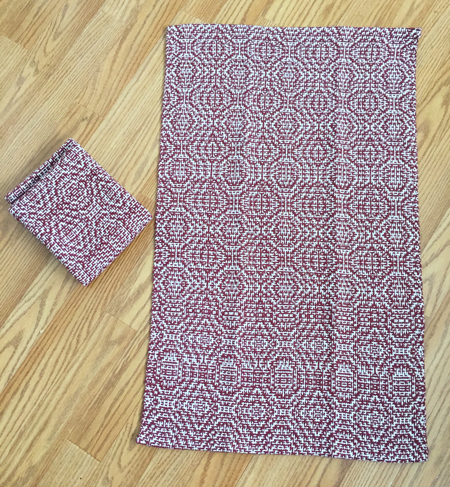 Not only did I decide to make more towels, but color-and-weave towels?? This requires 2 shuttles, which in my world takes more than twice as long as weaving with just 1 shuttle. But it was what I wanted to make. At least I was smart enough to only put on a warp long enough for 5 towels. These are the first 2 I wove. I kept losing my place in the treadling and likely made some mistakes. I decided I simply couldn’t take the time to go as slowly as this pattern required, plus it didn’t send me. So I changed the treadling for the third towel. Straight 1-4 treadling. Should have been easy, but you can see I have a few float errors (where the cranberry is darker). I didn’t see them till the final pressing, and decided that I’ll sell them as is since it won’t affect their functionality. Again, the pattern didn’t send me so I changed the treadling again, and again made 2 of these. Yesterday I finished weaving, washed, dried, pressed, and hemmed them. Today they joined the stack of all my other recent weavings that had to be measured and labelled. 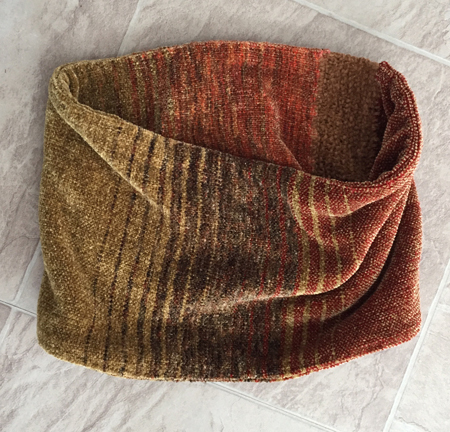 I also finished a chenille ‘extra’ length into a short cowl with a bit of knitting to make it long enough to go over your head. I have 2 more pieces that I can finish if there’s time. Plus other ideas. I always have other ideas. But I never have a clone, so plenty of things fall away. Do come and visit me if you’re near East Aurora this weekend. My my you have been busy! The shawls I missed posting on are lovely and who doesn’t like beautifully woven towels? I think the last towel is my fav! Sending wishes for a very successful sale! I have a love/hate relationship with 2 shuttle weaves. Love the way they look. Hate that they seem to take 3X longer to get done. I totally hear you on that, Kelly. I agree that 2 shuttle weaves take at least twice as long to weave, but it does feel like even longer. I don’t often do them, either, but the bug got into me on this one. Satisfied that desire for several months, I’m guessing. I have a very good customer that bought 2 overshot baby blankets from me a year ago. Now she needs at least one more. Well, they all sold. So I’m putting on enough warp for 12 more. If I’m threading 854 ends, I’m going to make it worth while. No telling how long that many will take to weave off.